As the IMF outlines in its announcement, when a member is in need of financing that is far in excess of its quota, a certain set of criteria need to be satisfied before any fund resources are committed. The country’s debt must be deemed sustainable with a high probability. When the IMF was called to Greece in the spring of 2010, it had to agree to be part of a programme of 110 billion euros, with its contribution set at 30 billion euros, which translates into 3,200% of Greece’s quota. Greece had to meet all of those four criteria for the IMF to be part of the program. Given the nature and the volume of the problems that Greece faced back in 2010, the IMF could not asses the country’s debt as sustainable with high probability. Because the IMF did not assess Greece’s debt to be sustainable with high probability, the framework required an upfront debt reduction. However, there were serious concerns at the time that this could lead to severe contagion both in the Eurozone and beyond. Greece was denied the debt solution that it clearly needed and this was masked behind the exception of systemic risk that was introduced at the time. 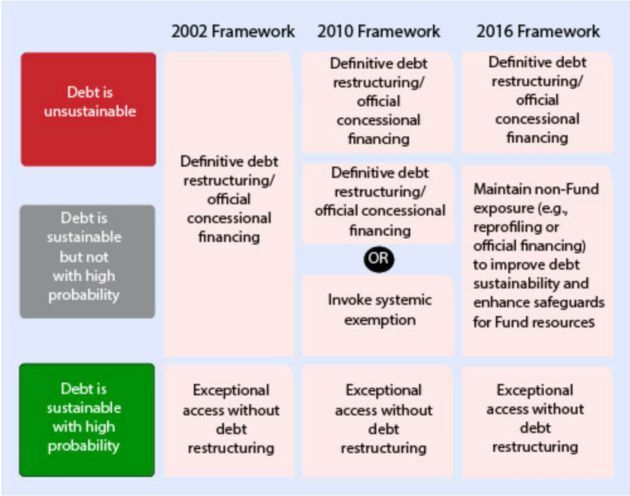 Based on the framework that existed up to 2010 Greece would have definitely needed a debt restructuring and would need official financing on favourable terms so debt sustainability was not aggravated. That type of solution at the time would have favoured Greece as a member of the IMF but would have severely damaged the eurozone not only because core banks had exposure to Greece but they had exposure to other peripheral sovereigns and banks after almost 10 years of financing integration in the euro. Also, a debt restructuring would imply that government bonds, which were considered risk free assets on banks’ balance sheets, would need to be risk adjusted and this would enforce additional capital requirements on banks that were barely recovering from the crisis of 2008-2009. For the eurozone as a whole, there might be limited gain in bailing in creditors who subsequently might themselves have to be bailed out. As such, Greece was denied the upfront debt restructuring that was needed and was forced into a belt tightening which was necessary but had severe intensity and speed, as program financing was allocated to debt repayments and not deficit financing. The Fund’s assessment has Greece written all over it and takes the debate right to the heart of the issue. Hindsight is not necessary to see that the Greek bailout was destined to fail from the start. An impossible task was compounded by the limited implementation capacity of the public sector and complex political and social dynamics. 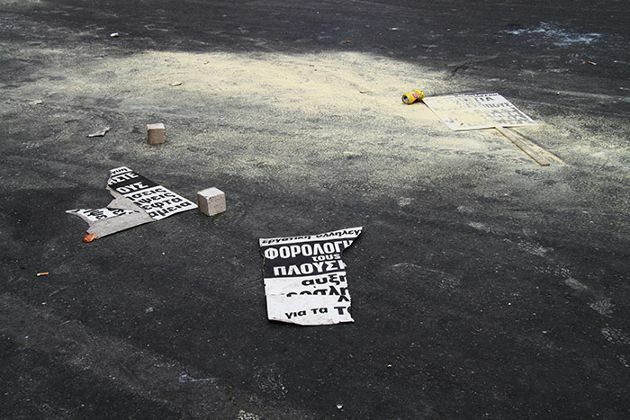 When the cracks in the program design were exposed as early as the beginning of 2011, Greece spun into a downward spiral of economic and social catastrophe of unprecedented proportions for a developed economy during peace time. According to the reformed framework for exceptional access, Greece probably would have been given a debt reprofiling for all private claims in the three-year life of the programme, the IMF would have provided financing and the eurozone would have to give loans at favourable rates (unlike the 300 basis points over Euribor which Greece was charged in 2010 to ensure getting loans from one’s Eurozone partners would not be a particularly pleasant experience). Greece’s debt was not addressed at the start when, by all admissions, it was necessary. Six years later it dominates the agenda, having climbed to just under 180 percent of GDP after three bailouts. The IMF has not confirmed its role in the latest programme partly because the issue of debt sustainability remains unresolved. Eurogroup chief Jeroen Dijsselbloem recently suggested that one solution could be for the eurozone to promise that something will be done in 10 or 15 years, underlining the fact that there is little appetite within the single currency area for proper debt relief, just as was the case in 2010. As if nothing has been learnt since then, Greece has to find an additional 3.5 percent of GDP in savings over the next three years to meet a primary surplus target that will give its debt an air of sustainability. The scale of fiscal interventions required is causing social tension, political instability, brings back country risk, halts investment, impacts on economic activity, hits the budget and so on and so forth. It is the same cycle that has been repeated over the last six years. The IMF has been remarkably honest on the shortcomings associated with its involvement in Greece. This admission must now also be put in practice through a genuine change of course in the Greek programme.